In 1800 Broadway House was one of the largest houses in the centre of the village of Plaistow. 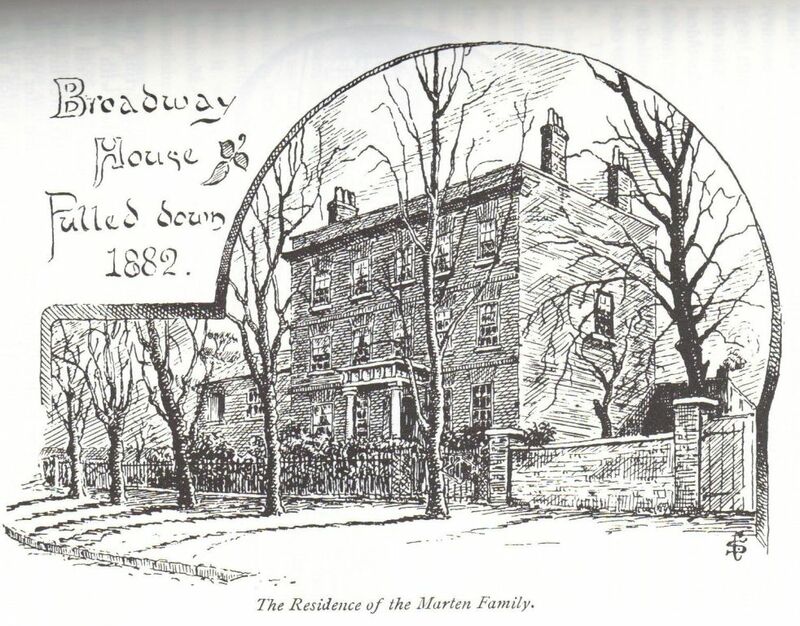 Robert Humphrey Marten moved there in about 1806 and lived there until his death in 1839.The move to Plaistow out of the City of London was particularly designed to aid the ailing health of his wife, Elizabeth. She survived there only unti 1812. His son Charles Marten continued in residence for a further 12 years before that line of the family moved to Blackheath. One anecdote related in John Spencer Curwen’s book on ‘Old Plaistow’, from where this sketch is copied, states that Robert Humphrey Marten was particularly proud of his lawn! The ‘non conformist’ community in Plaistow suited the Martens. The family was close to the family of John Warmington, whose daughter Eliza married Robert Giles Marten. Another resident and colleague was the famous meteorologist Luke Howard, with whom Robert Humphrey Marten was jointly awarded the freedom of the city of Magdeburg in 1814. It is reported that William Wilberforce was a frequent visitor to Broadway House too. Elizabeth Fry, another Quaker, lived nearby although we know of no direct connection.